Creative Minds: Path to Longevity May Start With … Bats and Mole Rats! 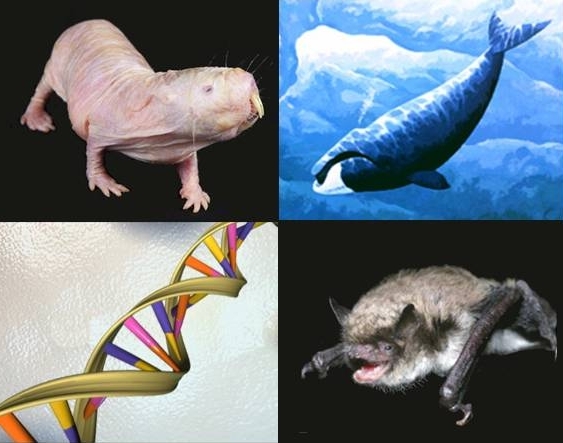 Caption: DNA studies are unraveling the secrets of these mammals (clockwise from top left): naked mole rat, bowhead whale, and Brandt&rsquo;s bat. It started simply, with the analysis of a trace element in proteins. It led, through recognizing and following provocative patterns, to one of humanity&rsquo;s greatest questions: what is the secret to a long life? This intriguing scientific path, traveled by NIH Pioneer Awardee Vadim Gladyshev, has brought together an assortment of mammals, great and small. It has relied upon a veritable global treasure-hunt, with samples from Russian caves, East African tunnels, and Arctic oceans. It was Gladyshev&rsquo;s scientific acumen that mapped this path. And it is comparative genomic analysis that provided the vehicle he has used to travel along it &ndash; right up to the threshold of new insights into healthier, longer life. Gladyshev is a professor of medicine at Brigham and Women&rsquo;s Hospital at Harvard Medical School in Boston. His scientific journey began 16 years ago, with research on the proteins in the body that contain the element selenium. In 2003, he discovered that there are 25 genes in the human genome encoding proteins that contain this essential trace element, incorporated as the alternative amino acid selenocysteine . Examining these selenium-containing proteins more closely, Gladyshev observed that several of them repaired proteins; others had antioxidant or other protective properties. There seemed to be a pattern here. Perhaps these proteins protected the cell and its DNA from damage and slowed the aging process.